Term 2 Adult Chinese Mandarin and Cantonese classes from 22nd April. Term 2 Adult Chinese Mandarin and Cantonese classes will begin from 29th April. Starting from 27th April onwards in Ascot Vale, Merri Creek, Box Hill, Bentleigh, Hawthorn, Montmorency, Northcote, Sandringham, Endeavour Hills, Newport, Deepdene and Mount Waverley for children aged 7-12. For more information on fees or an Enrolment Form for Children classes, please contact Olga at olga@accschinese.com or call her on 0421 709 414. Check out the video of our Chinese classes here! For Melbourne, lessons are held in CBD (Flinders Lane), Box Hill, Hawthorn, Clayton and Glen Waverley. For Sydney, classes are held at CBD (Pitt Street), Ultimo and Kirribilli. For Perth, courses are held in Perth CBD (Citiplace), Fremantle and Karawara. Why You Should Learn Chinese With Us in Melbourne, Sydney or Perth? 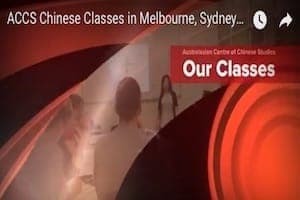 Established for over 25 years, this Chinese Language School in Melbourne, Sydney, Perth (Australia) and London (UK) caters for Adult and Children courses in Chinese Mandarin and Cantonese studies. Over 20,000 students have learnt with us! Lessons in this school are conducted using Accelerated Learning with native-speaking Chinese teachers specially trained by us. Our Chinese Mandarin classes range from Beginners to Advance Business Chinese Mandarin (over 20 levels), where students will learn practical Chinese in the fastest and easiest way possible using a fun and integrated approach. Offering e-learning support tools and concurrent classes (you can attend a lesson at any of our classes each week, if available), our students have maximum flexibility in their Chinese studies including the ability to defer their Course to another Term. Our specially developed course materials (textbooks, CDs or mp3s) are included in the student fees. This School also provides customised company classes and private tuition and is a Division of Global Business Strategies, a leading cross-cultural management training company based in Australia specialising in Asia Pacific business cultures and languages. "ACCS have a fun and interactive approach to learning Chinese that makes it easy to learn and keeps you coming back for more. I can't believe how much I've learnt in a such a short period of time." "Yes, I have enjoyed the Chinese Mandarin lessons and found most useful the story telling, explanations and listening to the teacher, particularly at the end of evening." "After the first lesson of Chinese Mandarin, I was genuinely excited to come back to the classes each week. It is always something I look forward to after a long day at work during the day. The story-telling in the classes are very helpful in trying to remember the characters. I particularly appreciate the time we have in practising handwriting and conversational skills. The whole class structure is based on interaction, making it very fun and engaging." "I have enjoyed the classes and found the story telling, the music and the native speakers to be most useful. The suggestive element helped memorisation and motivation." "I have learnt and recognised quite a number of chinese characters since the course and my conversation level is definitely on the improve." "You guys really provide the best customer service I've experienced so far with language courses!"